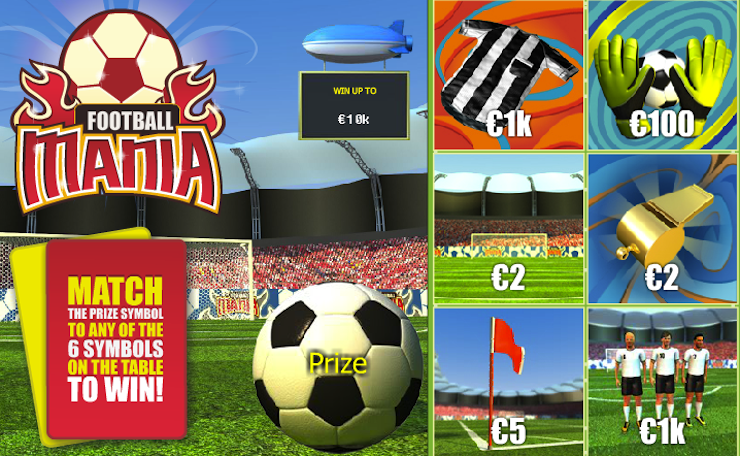 Casino game Football Mania - play now! Europa Football Mania needs no installation. The object of Football Mania is to match the Prize symbol on the football to any of the six symbols on the scratch card. If one of the symbols on the scratch card is identical to the symbol on the football you win the Prize. Select your bet per scratch card by clicking + or - next to the Card Value field in the lower left of the game window. Click Shuffle if you want to choose a different scratch card. Note that you can shuffle the scratch card up to three times during one game round. Click Play in the lower right of the game window to purchase the scratch card. Scratch the fields on the scratch card, one by one, and the Prize field on the football. Click Scratch All to have the card scratched automatically. You can also play using the Autoplay function. Click + or - next to the Autoplay field to select the number of cards to be scratched consecutively. Clicking the play button starts the Autoplay function. During Autoplay the scratch card is scratched automatically. The active Autoplay session can be stopped by clicking the stop sign.